research customer visits focus groups surveys choice modeling experimentation Author Edward F. McQuarrie describes how each technique works, along with its costs, uses, tips for success, and when and how to use certain techniques, as well as precautions to take while using them. 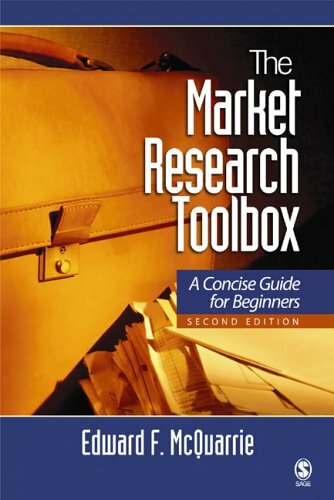 New to the Second Edition : Includes new chapters on questionnaire design, sampling procedures, and data analysis to ease students into developing their own market research Expands the discussion of how to determine needed market research via analysis of the underlying decision problem Contains updated suggestions for additional reading to provide students with the most up-to-date resources on market research Provides an Instructors Resource CD containing PowerPoint slides, case questions, teaching notes, and a sample syllabus The Market Research Toolbox is a valuable textbook for a variety of advanced undergraduate and graduate business courses such as Marketing Research, Marketing Management, Customer Service, Industrial Marketing, Sales Management, Consumer Behavior, and Product Development. It will also be of particular interest to product managers, research & development managers, program managers, engineers, quality professionals, and executives responsible for developing business strategies. Advertising Research, and the Journal of Advertising . ï¿½He serves on the Editorial Board of the Journal of Consumer Research .ï¿½ï¿½ He is currently Associate Dean for Assessment & Improvement at the Leavey School, responsible for the assessment of learning outcomes and the evaluation of teaching.ï¿½ He was Associate Dean for Graduate Studies 1996-2000, responsible for the MBA and Executive MBA programs. ï¿½ Professor McQuarrie has moderated focus groups since 1980, for Burke Marketing Research among others. He has consulted for a variety of technology firms, and has taught seminars on Effective Customer Visits, Managing Focus Group Research, Marketing Research Methods, and similar topics for Hewlett Packard, Sun Microsystems, Microsoft, Apple Computer, Tektronix, Varian Associates, Cadence Design, and other clients.